3M Coban Self-Adherent Wrap from HealthyKin.com is a self-adherent elastic wrap that functions like a tape, but sticks only to itself. Available in a variety of widths and colors to meet your application needs. 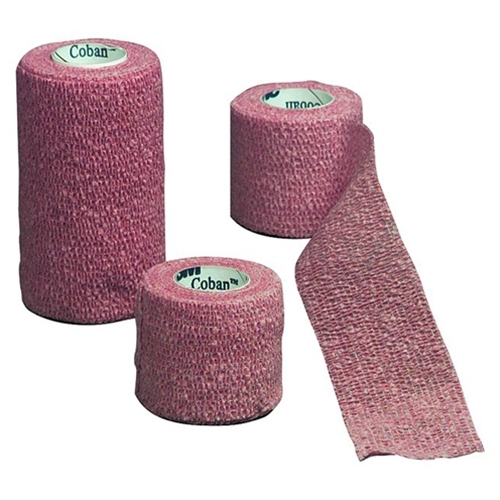 Coban self-adherent wrap is a laminate of non-woven material and elastic fibers placed lengthwise to provide elasticity. The elastic wrap contains a cohesive material that makes it stick to itself but not to other materials or skin. Caution: This product contains natural rubber latex, which may cause allergic reactions (unless otherwise noted). This product is so nice to use to protect skin form tape irritation. And the price is reasonable, too. Excellent product at a very fair price. BEST PRICE ANYWHERE! Online, in pharmacies, or medical supply shops! I'm so happy I discovered HealthyKin! The standard for wrapping over dressings. Good quality and fast delivery at a fair price. Great product, not too badly priced, but it would be nice if it was possible to buy smaller quantities. 18 rolls is darn near a lifetime supply! I always search on the internet for the best price/S&H. Your prices can't be beat. Thank you! Just wish it was a little cheaper !!! We use this as the top layer for my moms compression wraps for her edema... she loves bright colors so I was happy this time to find it in blue.